New Delhi: A new overseas consular section and visa issuance centre for UAE visas was opened in New Delhi. The consular services section will ease the issuance of Emirati visas for Indians and residents of India, which will facilitate the entry of Indian workers to the UAE. This is the sixth overseas centre opened by the UAE abroad. It will speed up and accelerate entry procedures via e-gates at UAE entry points. The centre was opened by Mohammad Mir Abdullah Al Raisi, Undersecretary at the Ministry of Foreign Affairs and International Cooperation. 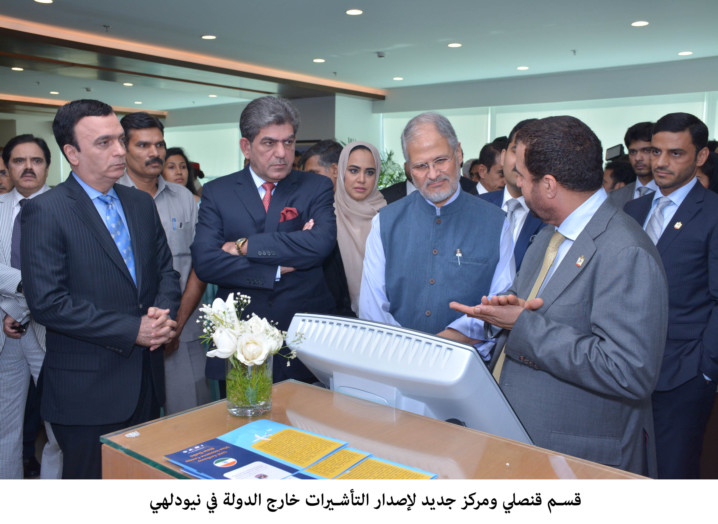 Najeeb Jung, Lieutenant Governor of Delhi, and other Emirati and Indian officials were present. The centre adopts the highest internationally acclaimed techniques in providing its services and issuing visas to achieve customer satisfaction. Indians who want to work in the UAE can submit their documents, biometric screening and medical certificates issued by accredited health authorities to obtain UAE visas. The centre will verify the authenticity of passports and medical certificates, and analyse biometric screenings, such as retinal scans, fingerprints and face prints. This will help make sure that people entering are free of contagious diseases, which will in turn save the country the cost of recruiting, quarantine and deportation. Al Raisi expressed his appreciation of the efforts and constructive role played by the Indian government in bolstering relations between UAE and India, which are now witnessing developments in various areas. He pointed out that procedures in the centre are in line with leading global practices for issuing visas. For his part, Jung said that the centre marks an important achievement in the field of strengthening bilateral relations. He expressed his appreciation of this positive initiative by the UAE, and praised the systems followed by the centre which saves time in the process of submitting applications and issuing visas.